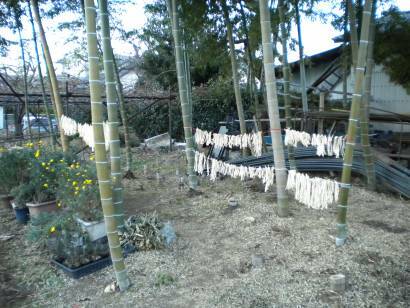 While out walking one evening, I spotted these strips of daikon drying at nearby farm. Daikon season is slowly but surely coming to a close (ours at the farm are all gone and the field is cleaned up in preparation for its next incarnation), and drying is one of the surefire ways to preserve the vegetable for later use. We've used these ourselves in miso and cut into smaller bits in our rice, too. This farm is just north of us, and despite being surrounded by city on almost every side (a nashi orchard and chestnut grove are near neighbors) it manages to retain some of its traditional rhythms like this one. Winter is a great time for this as the air is so incredibly dry (hence the daily views of Mount Fuji), and so even thick fruits like kaki can be preserved in this way. Does the daikon really dry up that small? I don't think I've ever seen them dried, just they giant ones we would grate. They do indeed, especially when cut into strips like they are here. I've also seen whole ones hanging to dry at another farm (can't find the photos at the moment)that shrink up quite impressively. There are also different varieties, and I'm betting some are better suited to drying, pickling, etc., than others. I don't know how long the strips would take to dry, but I could imagine a handful of days. Winter weather tends to be much less humid than what we're experiencing now, and so is prime for drying. Although, that said, I'll be setting umeboshi to dry just after the rainy season ends. The humidity then won't have reached it's peak for the summer, and the sun will be just starting to bake our little world. 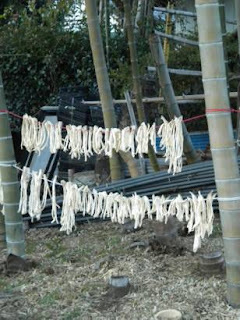 Back to your question...a whole daikon would take longer, of course, than the strips. My guess would be more than a week. It remains one of the culinary mysteries I hope to solve this coming fall and winter, along with making my own miso.